The Turtle Beach PX22 delivers great audio in a comfortable and pretty affordable package.
] The Turtle Beach PX22 is a multi-platform PC, console, and mobile-compatible gaming headset that proves you really can “have it all”. 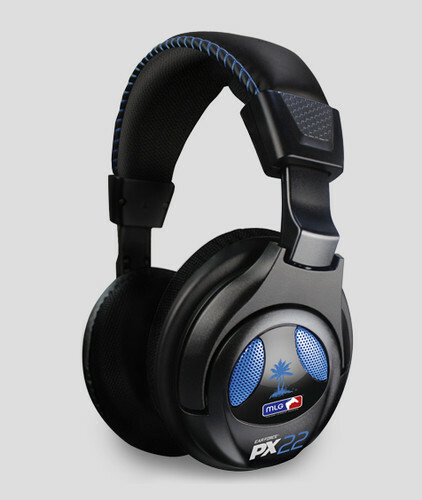 Which is to say that the PX22 is a great console headset that gets everything right for PC gamers too. Some (if not many) multi-platform headsets are really just console headsets that happen to be PC compatible by virtue of having 3.5mm connectors—unless you’re the Skullcandy PLYR2, which doesn’t even have the decency to include a 3.5mm connector despite its claims of PC compatibility. But the PX22 does it all—and pretty much gets it all right. Headband: ½” thick leatherette cushioning. Ear cups: ¾” soft cloth-covered memory form. The PX22 is comfortable. I wouldn’t quite place it in the same class as SteelSeries Siberia V2 or the Razer Tiamat, but it’s still perfectly comfortable—and on a side note, if you keep your hair super short like I do, the PX22 is far more comfortable than it’s much more expensive cousin, the XP Seven—which pretty much requires a “comfort tuke” or other accessory to make more bearable for extended periods. The PX22 also provides a moderate amount of external noise suppression—more so than headsets like the Razer Carcharias (which offers virtually none), but not to the level of the Turtle Beach XP Seven (which almost completely blocks all external noise). On the whole the PX22 strikes a happy medium between the two. Inline controller: The PX 22’s amplified inline controller includes volume, bass, treble, and microphone mute. In addition, it features a variable microphone monitor, game and chat volume controls, an Xbox 360 chat input, and mobile phone connector. Inputs: The inline controller includes one Xbox 360 chat input and a mobile phone input. Microphone: Swivel up/down and fully flexible microphone. Although I’m not normally a huge fan of inline controllers, the PX22’s is definitely a cut above average. In addition to volume and microphone mute, the PX22 controller provides discreet volume adjusters for bass, treble, chat and headset volume mixers. It also has an input for a mobile phone. The swivel microphone is also ultra flexible and acquitted itself well for calls, voice chat, and Skype. The PX22 doesn’t require any software drivers—just a USB connection and a 3.5mm stereo connector (for us PC players). The PX22 audio quality impressed almost immediately. I used the PX22 for a solid month, taking it to work where it was used for music and occasional Skype calls, and using it at home for PC gaming. Granted, audio quality is always a highly subjective evaluation, but for $80 I think the PX22’s offer some of the best quality audio in its price range. The PX22’s produce big bass, and it never got ‘muddy’ even at nigh ear-splitting volume levels. But it’s not just big bass that counts—the PX22’s deliver very clear mids and highs as well—so you can you’re your loud and thumpy (big explosions) and clear voice (and music) too. The PX22 is also compatible with consoles and mobile devices. You can detach the headset from the inline controller and use the PX22 as a simple mobile headset, or you can connect your phone to the inline controller and use the PX22 for simultaneous phone calls and gaming. The PX22 offers good comfort, above-average design and flexibility, and stellar audio—in short it’s probably one of the best headsets you can buy in this price range.